Natural and Artificial Flavors, Silicon Dioxide, Sucralose, Polydextrose, Acesulfame Potassium. SHAKE CONTAINER BEFORE EACH USE. Add 1 scoop (provided) of powder to 12 fl. Oz. (360 mL) of water. Shake until dissolved. Consume 15-30 minutes prior to workouts. Begin with ½ serving (1/2 scoop) to assess tolerance. This product is formulated with ingredients that absorb moisture and can lead to clumping of the powder. This is normal and the product is okay to consume. Some individuals mat notice a tingling sensation which is harmless and attributed to Beta-Alanine. THIS PRODUCT IS ONLY INTENDED TO BE CONSUMED BY HEALTHY ADULTS, 18 YEARS OF AGE OR OLDER. Do not use this product if you are pregnant or nursing. Before using this product, consult a health care professional if: you are taking any dietary supplement, prescription drug or over-the-counter medication; or if you have any medical condition. This product contains caffeine and should not be used with other caffeine or stimulants from other sources. Immediately discontinue use and contact a medical doctor if you experience any adverse reaction to this product. Do not exceed recommendations for suggested use. Use only as directed. Do not use if safety seal is broken or missing. KEEP OUT OF REACH OF CHILDREN. Potassium Citrate, Sucralose, Polydextrose, Natural and Artificial Flavor, Gum Blend (Xanthan Gum, Gum Arabic), Acesulfame Potassium, Silicon Dioxide. Silicon Dioxide, Natural and Artificial Flavor, Sucralose, Polydextrose, Acesulfame Potassium. 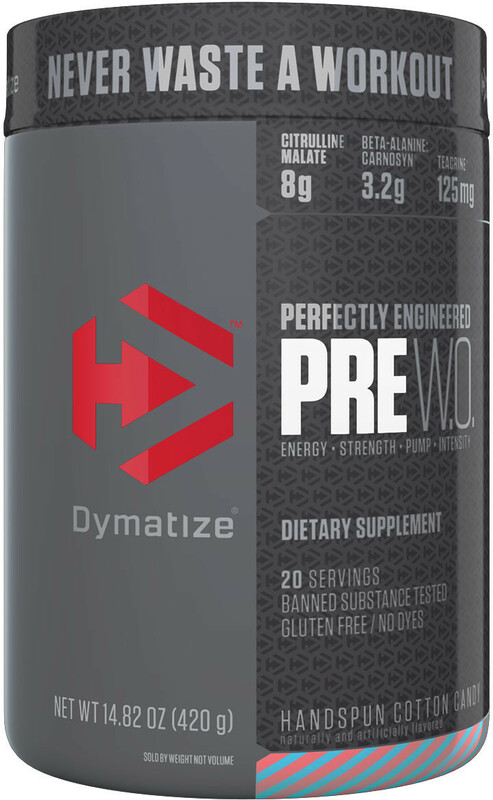 Jun 28, 2017 Dymatize Pre W.O. 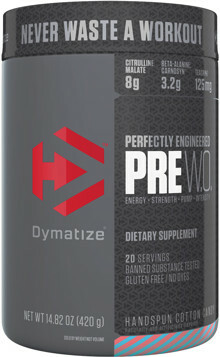 — A Mainstream Pre Workout that DELIVERS! TeaCrine works to increase alertness and focus during exercise. At 125mg, TeaCrine is able to work with caffeine to support cognitive benefits during exercise to Never Waste a Workout!